Kavak in Pemón means “macaw” – it is a small community close to the Pemón villages of Kamarata and Santa Marta that consists of several comfortable churuata dwellings built specifically for tourism – where one can chose hammocks or beds as their bedding down of choice. Kavak combines three separate lodges operated by two local Pemón families (Calcaño and Sandoval) and the community of Kamarata. 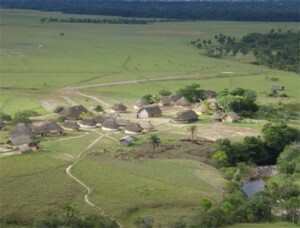 The lodges are known as Macunaima, Excursiones Pemón and Kavak-Yeuta. The lodges were constructed close to Kavak River – that winds its way into a gorgeous canyon at the end of which is the beautiful Kavak waterfall. In order to enter the canyon one must join the Pemón guide in an indigenous chant to the spirits. A truly spiritual place to visit. Kavak is another jewel of Kamarata Valley and like its neighbour Uruyén (Yurwan) is a magical place and pretty much off the beaten track. Hence it is highly likely that you may have the lodge completely to yourselves when visiting. It is located in beautiful Kamarata Valley situated in a savanna ecosystem within hiking distance of the local Pemón settlements (villages) of Kamarata, Santa Marta, Old Uruyén and nearby waterfalls, as well of course to the impressive Kavak canyon. Needless to say the location is serenity itself – a personal visit is a must – a great place to unwind! The “community” is overlooked on all sides by spectacular tepuis – Auyántepui in particular – and situated at the edge of the savanna. Activities include a stiff hike up to La Toma, the viewpoint overlooking Kamarata Valley and Kavak waterfall. La Toma has a rock perching precariously on another called “La Murey” – the local myth says that if this rock ever topples off the other, the world will come to an end! Go see it for yourself it defies the laws of gravity. Other local hikes are possible to neighbouring indigenous settlements, as well as trekking, cultural visits / dances, swimming, visits to local waterfalls dotted around the area and even curiara trips on the neighbouring rivers. If really energetic it is possible to invite the Pemón teenagers to rally for a game of football (soccer) – they love the game.